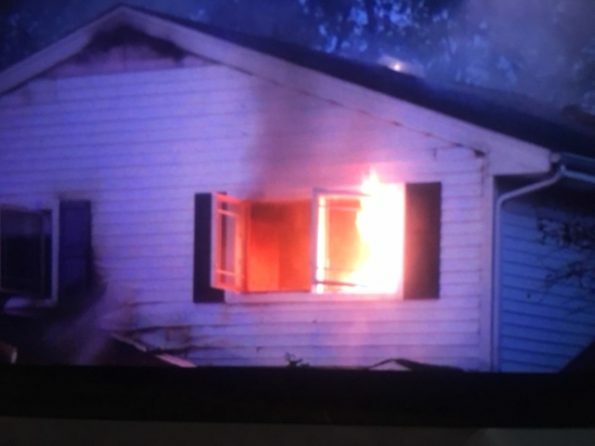 House fire on Crest Avenue — Citizens Rescue, No Injuries … regarding citizen rescuer Brett Tanner interview, are those kids saying “That’s my daddy!” ??? Elk Grove Village police and firefighter/paramedics responded about 5:25 PM Wednesday October 10, 2018 to a report of a house explosion at 525 Crest Avenue Elk Grove Village, Il. Police and firefighter/paramedics received a report that neighbors went inside the house to rescue people inside the house. One neighbor, Brett Tanner, went in to alert people inside the house that their house was on fire. He noticed the fire when he was mowing his lawn. He said another neighbor helped him shortly after he entered the house. Smoke was initially outside, but when the door to the house was opened, smoke set off the smoke detectors and became thick inside the house. This happened as fire was spreading from the garage to the house. Brett Tanner helped four people get out of the house to safety across the street. Another neighbor backed him up seconds later. A Daily Herald reporter found the second citizen rescuer and reported that Jim McEnroe helped Brett Tanner, who had already run across the street and into the burning home. The two helped an older man out of bed and into a wheelchair, and got him across the street. An attempt to exit with the wheelchair at a side door caused smoke to billow over the roof and into the side door and interior of the house. A decision was made to exit the front door, and everyone escaped safely without any injuries. Another two to four minutes and the house fire would have entrapped the four people in the house. Without the actions of the neighbors, one or more of those people would have probably died. Initial explosions reported were likely vehicle tires exploding. Engine 8’s crew on arrival reported heavy smoke blowing across the street with a car fire on the driveway and a possible fire in the residence. Heavy fire was eventually showing from soffits, and smoke was showing from all sides of the house. Smoke was so thick and hanging low that firefighters warned incoming crews that visibility was difficult on the street. Engine 9’s crew was assigned to attack the fire from the rear of the house. Engine 10’s crew was assigned Rapid Intervention Team. Ambulance 10 was assigned medical. Engine 8’s crew had a positive water source by 5:37 p.m. A neighbor said the neighborhood was unincorporated and that there were no fire hydrants near the house. Elk Grove Village firefighters apparently connected to the nearest fire hydrant from an Elk Grove Village source. Arlington Heights Tower Ladder 1 was positioned on the street at the front of the house hitting the fire that was through the roof. Interior firefighters had to back off from where Tower Ladder 1’s water stream was coming down from the aerial position. Also, firefighters cut through a back wall near the attic and hit fire in the attic with a stream of water from the outside. 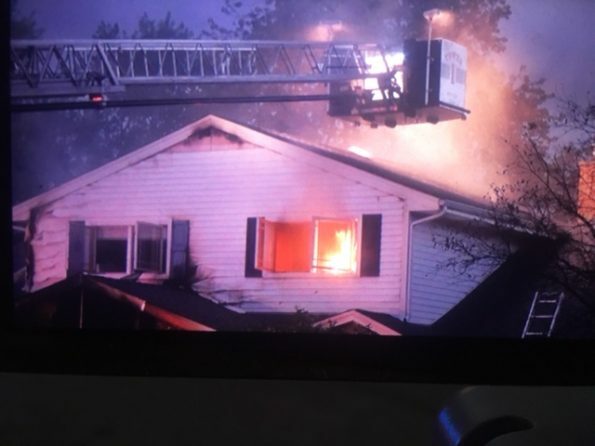 The fire was knocked at about 6:16 p.m. but flared up on the second floor in a bedroom in the right, front corner of the house (viewed from the street). That fire was quickly knocked down by firefighters with a hose line positioned on the driveway. Elk Grove Village fire command upgraded the call to a working fire response at 5:25 p.m. and upgraded the response to a MABAS Box Alarm at 6:34 p.m.
An addition was recently constructed at the back of the home. The addition was not significantly affected, but fire spread rapidly throughout much of the original home. At one point in time fire was showing through the roof and siding was bubbling and deforming before flames broke through to the outside on the left side of the house (viewed from the street). Firefighters due on the MABAS Box Alarm assisted Elk Grove firefighters for several hours, overhauling and washing down the house to completely eliminate hot spots and ignition sources at the house. Earlier, at least one neighbor was worried the fire would spread to her house. The official National Weather Service wind speed at O’Hare International Airport at 5:51 p.m. was Southwest at 8 MPH and at 6:51 p.m. was Southwest at 9 MPH. High wind gusts started between 6:51 p.m. and 7:51 p.m., gusting 30 MPH to 37 MPH from the southwest and then the west past 2:00 a.m.
Flames flared up in a second floor bedroom at a house fire on Crest Avenue, Elk Grove Village. BOX ALARM DETAILS: MABAS Division 1 Box Alarm on Box #8 for a structure fire (house fire).